Kris Balderas-Hamel speaks about Workers World newspaper. 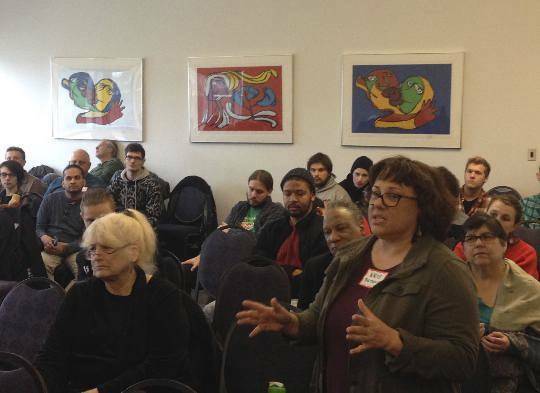 Workers World Party’s Detroit Branch, along with the Wayne State University chapter of Students for a Democratic Society, hosted a Midwest conference March 24-26 on resisting capitalism and all its oppressions and fighting for socialism. This important gathering took place during the 100th anniversary year of the Russian Revolution, which was discussed at the conference, along with the need for socialist revolution in the United States here and now. Conferencegoers came from many states, including Wisconsin, Illinois, Indiana, Ohio, Kentucky, West Virginia, Maryland, Pennsylvania, New York and New Jersey, and were predominantly youthful. More came from Detroit and other Michigan cities and towns. For many it was their first WWP conference. 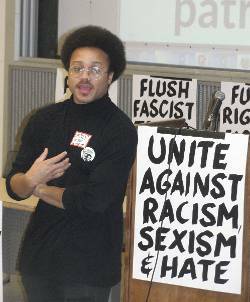 The weekend kicked off the evening of March 24 with a “Red, Black and Queer” slideshow presentation by longtime union and LGBTQ organizer Gerry Scoppettuolo of Boston before a packed house at the Detroit WWP headquarters. “Red, Black and Queer” refers to the Marine Cooks and Stewards Union in the Congress of Industrial Organizations which achieved unity of Black, white and gay union members. The slideshow referenced decades of people’s resistance in the struggle for LGBTQ liberation. During the conference, a wide range of topics affecting working-class and oppressed peoples in the Midwest and beyond was discussed at plenaries and in break-out groups. 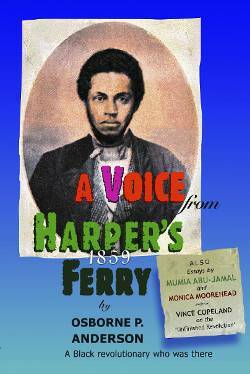 These included fighting ruling-class Jim Crow attacks on public education, unions, women, LGBTQ people and more. Others highlighted the Fight for $15 movement, the prison-industrial complex, the fight to free Michigan political prisoner Rev. Edward Pinkney, May Day strikes and immigrant rights, and the struggle for women’s and LGBTQ+ liberation. For many young activists it was their first time speaking at a socialist conference. The battle waged in Detroit against the devastation wrought by the capitalist banks and the largest municipal bankruptcy in U.S. history were discussed. Much more from the front lines of the people’s struggle was analyzed from a Marxist viewpoint and within the context of overthrowing capitalism and fighting for socialism. The thoroughly internationalist conference included speakers Lorena Buni, chairwoman of Anakbayan Chicago; the National Solidarity Officer of Anakbayan USA; Claude “Toutou” St. Germain, Haitian leader of Boston Fanmi Lavalas; and Jesús Rodríguez-Espinoza, Consul General of the Bolivarian Republic of Venezuela in Chicago, who gave a special presentation on the political struggle in Venezuela. WWP First Secretary Larry Holmes and Teresa Gutierrez, a WWP national committee member from New York City, spoke about struggling in the Trump era and making May Day a general strike for immigrant rights, respectively. Other talks included steadfast defenses of Africa, Yemen and Syria from attacks by U.S. and NATO imperialists and special tributes to the 1917 Bolshevik Revolution and Fidel Castro, leader of the Cuban Revolution. Each plenary ended with an open-mic session where conference participants could comment, ask questions, raise political concerns and provide information about struggles in their area. After the conclusion of the first day, members of the SDS chapter, youth members of WWP and allies participated in a demonstration demanding gender-neutral bathrooms on the WSU campus. The youth, students and allies marched throughout the campus and militantly defied Detroit and WSU cops who were menacing and harassing them. A cultural event took place at the WWP headquarters following the protest. It was emceed by WWP member and Michigan Peoples Defense Network activist Mond Jones and included youth and students doing a range of cultural presentations. Cambria York, a WWP member from Indiana, led a spirited sing-along of militant and revolutionary songs. The event lasted until the early morning hours. Leaders of the Boston School Bus Drivers, United Steelworkers Local 8751 kicked off the last day of the conference, March 26, with rousing talks on their union victories and the role of solidarity and WWP in forming and maintaining a fighting, militant union. A variety of active and retired union members participated throughout the weekend, as did many unorganized, unemployed and underemployed workers. An open mic brought many young revolutionaries up to speak, stoked by the conference and the spirited yet disciplined militancy they experienced the day before. At the conclusion of the conference a tour of Detroit on “Labor History, Black Liberation and Capitalist Devastation” was led by Abayomi Azikiwe and Martha Grevatt. Cambria York, an agender (without a gender) organizer from Indianapolis, told WW: “I found Detroit to be a microcosmic representation of the horrors capitalism can unleash upon the world, centralized in the locality of the most disinherited and disempowered, and an immensely prescient reminder of the work we have at hand and ahead of us. Joe Mshahwar, a youth leader in the Detroit WWP branch and a key conference organizer, gave Workers World his assessment of the revolutionary weekend: “The conference was a tremendous success. Youth cadre, with the support and hard work of older comrades, were able to pull off a thoroughly Bolshevik conference in the midst of a multifaceted ruling class offensive on local, state, national and international levels. Comrades and allies brought powerful analysis rooted in struggle, spanning our fight on the streets of Detroit to the fight on the streets of Caracas. Conference sessions can be viewed on the Workers World Party – Michigan Facebook page.